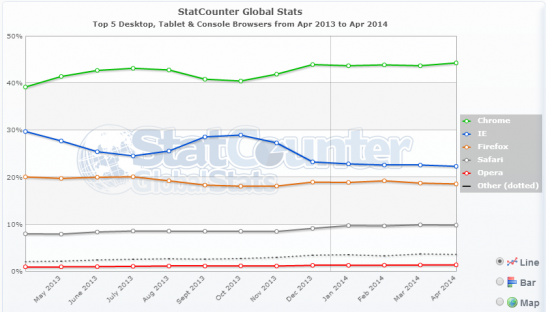 Microsoft Finally Drops IE6, so What Browsers are Popular? With cross-platform browsing becoming more and more relevant, Microsoft dropped support for IE6 after usage in the US dropped below 1%. This begs two questions: Who was using IE6 for so long, and what are browsers are being utilized now? Chrome is definitely on the up and up, being utilized by over 40% of users, and IE11 is declining as 2013 ends, which is coincidentally when users started to use Chrome and other browsers more often. 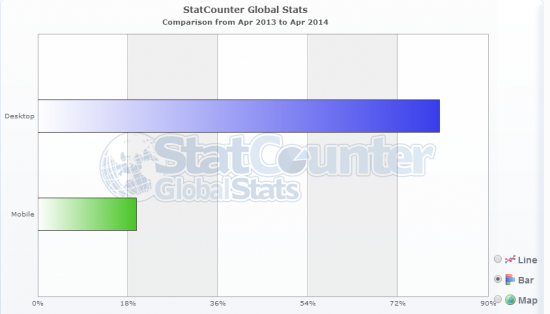 Firefox use has been consistent, showing some decline through the end of 2013 and making a comeback in the first quarter of 2014. Safari is showing some growth at the last quarter of 2013 and continues to increase through the first quarter of 2014, although it’s not as significant as the other three browsers. The combined others, illustrated as the dotted line, are barely above the 0% mark, which is still above Opera usage. Opera seems to keep changing the use of its User Agent string, which names the browser the user is in, making it difficult to properly identify what browser is officially being used, slightly skewing the statistical results. It seems like with the decline of Internet Explorer comes the burgeon of the other browsers: Chrome, Firefox and Safari. Other users are taking the initiative and choosing a browser more fitting to them rather than use the familiar IE. The desktop operating system usually dictates what browsers are utilized by the user. For instance, the Safari browsing application comes on all iOS desktops, laptops, and devices, while Internet Explorer is the default browsing application for Windows Operating System. Internet Explorer is fighting its own previous versions, like IE6-IE8, since a lot of desktop users are set in their (outdated) operating system, such as Windows XP, which ultimately impairs the growth of usage of their newer browsers. Desktop internet usage is at 76%, bringing Mobile internet usage to account for the other 24%. Mobile internet usage is increasing and with different mobile browsing applications hitting the market as well as devices coming equipped with browsing applications themselves, the game will be changed for classic internet browsers altogether.